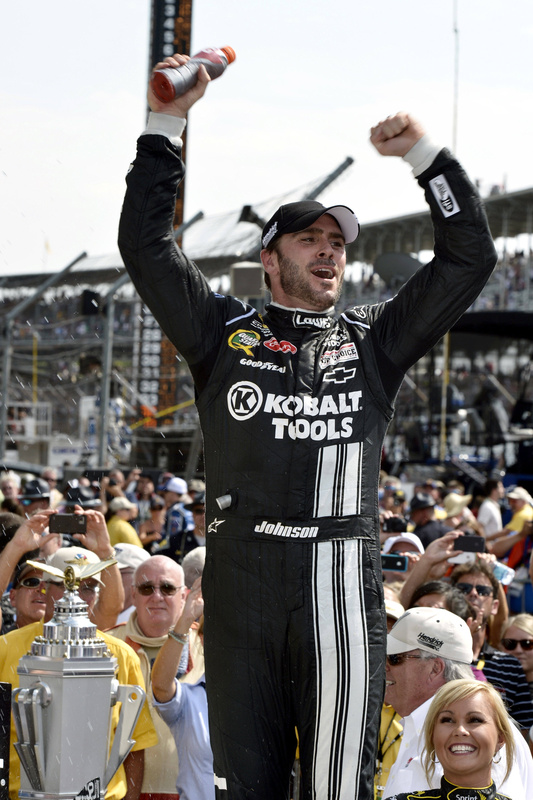 Jimmie Johnson won his fourth Brickyard 400 title Sunday in Indianapolis. INDIANAPOLIS – Jimmie Johnson fondly recalls watching the Indianapolis 500 as a kid in California, rearranging the couch cushions so he could pretend he was sitting in a race car. Johnson’s grandfather was an A.J. Foyt fan. Johnson liked Rick Mears. And now Johnson might be mentioned in the same breath as those two drivers and other Indy greats. The victory also puts Johnson among some top names in the track’s record books. Only three drivers have won four Indianapolis 500s: Foyt, Mears and Al Unser Sr. Formula One ace Michael Schumacher won the U.S. Grand Prix five times on Indy’s road course configuration. “They’re that good, and they deserve it,” Gordon said. It was a rough day for Matt Kenseth, who came into Sunday’s race with the Sprint Cup Series points lead but was taken out of the race in a late collision with Joey Logano. While Johnson ruled the day, Earnhardt walked away with the points lead – 14 points ahead of Kenseth. But Johnson’s big moment was seen by another disappointing crowd at what still is considered one of the Sprint Cup Series’ most prestigious races. After drawing huge crowds for more than a decade after the first NASCAR race at Indianapolis in 1994, attendance has been sagging in recent years. The front-stretch stands were fairly full but there were sparse crowds in the turns. Attendance was 125,000, although media estimates were lower. Jeff Burton’s flat tire brought out a caution with 36 laps to go, giving the leaders an opportunity to make their final pit stops. Biffle’s lead didn’t last long, as Johnson went around him on the front stretch with 29 laps to go.